File this recipe under OMFG, because Sticky Banana Pudding with Butterscotch Sauce is really, really good. Beat the butter and sugar until creamy, then add the eggs one at a time. Stir in half the flour, half the banana, all of the sour cream and milk, then the remainder of the flour and banana. Bake in a large, lined casserole or cake tin at 170 degrees Celsius for one hour and ten minutes. Stand for ten minutes before turning out onto a plate to serve. Serve with Butterscotch Sauce and cream or ice cream. 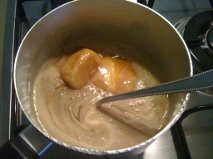 Stir all ingredients together in a pan until the sugar dissolves, then simmer, stirring for three minutes.